This past Friday night (November 14) the Little Girl and I went over to the new Avalon shopping center off Old Milton Parkway in Alpharetta to attend the Orvis Alpharetta store's grand opening party. They had quite the turnout, that little shop was absolutely packed with folks celebrating the new store. With the barbecue sandwiches, beer from Sweetwater Brewery and classic country music from Whiskey Belt, a good time was practically guaranteed. 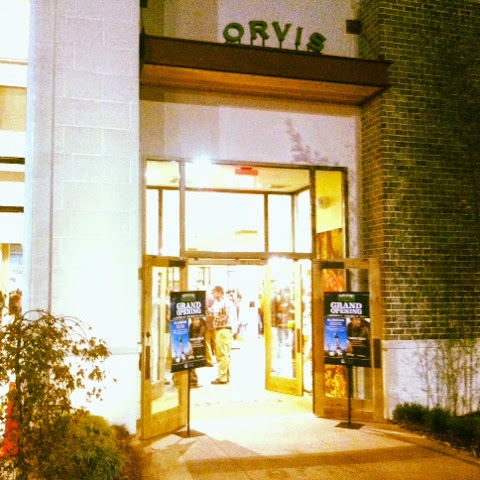 If you're in the vicinity of Alpharetta and you're into Orvis' clothing, then this is definitely the store for you! Lots of apparel and accessories to suit the sporting lifestyle. The back of the store (or front, depending on which entrance you use) is dedicated to fly fishing gear. It's probably not the largest fly fishing selection in an Orvis store, but they certainly stock the essentials. As far as the hunting gear goes, you're probably going to be directed to a catalog as it didn't seem like there was enough room in the store to stock any of it. I wish them success in their latest location. In my opinion, you can never have too many fly shops! If you're in the neighborhood, drop by and check them out. Despite having a severe allergies attack this weekend, I managed to get out and do a bit of fishing! Sunday morning I went up to Unicoi State Park, just above Helen, GA, to fish the Delayed Harvest stretch of Smith's Creek. This was my first experience fishing the delayed harvest and I was sure excited by the prospect of catching multiple fish larger than most I've caught so far. On the way up to the state park I stopped into Unicoi Outfitters for a stream report and see what flies they might suggest. After talking to the guys behind the counter for a bit, my confidence level was elevated even more. I got up to the park and had to look for the Visitor's Center to check in and get the park permit to fish. That was my first mistake. After driving around the park, trying to follow the signs, for what seemed like half an hour, I found the Visitor's Center, tucked deep inside the camping area, locked up tight. By this time it was after 9:00 and the Center was supposed to open at 8:00. I got back in the car and followed the signs to the Lodge, thinking that someone would be working there on a Sunday morning. I've spent a little bit of time at Unicoi, so I thought I knew where I was going. I didn't. I made it to the Lodge and parked in the first spot I could find and walked in. I was on the restaurant level. Third floor. Back of the building. I wandered around looking for an employee and finally found a guest that knew where the registration desk was. Ground floor. Front of the building. I got all checked in, got down to the correct parking area, geared up and headed toward the water. As soon as I got to the creek, I saw three guys rigging up and fishing (the parking lot was still in view!?!). One of the pieces of advice I got from the guys at the fly shop was to walk and since I enjoy hiking as much as fishing, that's what I did. I followed a bike trail for at least half an hour, maybe closer to 45 minutes, before I thought I had gone far enough and my rod started begging to be cast. I was in the water around 10:00 am. I fished until about 4:30, when the sun was starting to drop behind the mountains. I didn't want to be caught in the dark in an unfamiliar place, and I didn't know how long it would take to walk back to the car. I fished the whole day. Threw one of every fly pattern I had in my box and I never caught a fish. I got one soft bite and saw the flash as the fish threw the hook. I could go on and on finding reasons why I didn't catch anything when a banner day was supposed to be a sure thing. I probably wasn't holding my tongue right, the weather change put the fish down, the water was too clear and the sky too blue, but the fact of the matter is, I had a wonderful day. I get frustrated when I don't catch anything, but I still got to spend the day knee deep in a near perfect stream in the woods on a gorgeous fall day in North Georgia and that, to me, makes it worth it every time. I'll be back to try again, just as soon as I can restock my fly box. If you want to fish the Delayed Harvest at Smith's Creek or any of the other DH streams in Georgia, I put a link to the GA DH Fishing Regs in the sidebar. Make sure you stop into Unicoi Outfitters when you go, too, it never hurts to have a couple of recommended flies from the guys who know and a little local knowledge goes a long way! 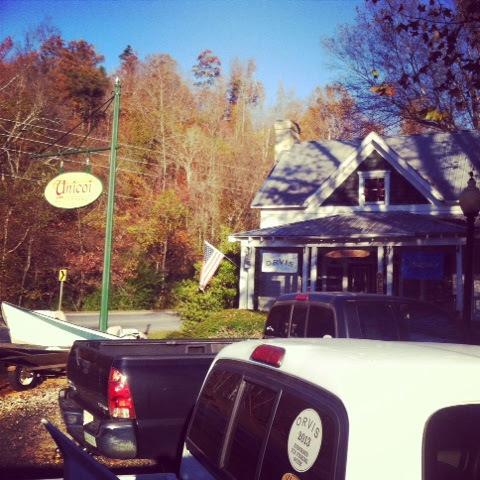 Oh, and remember, check in at the Lodge at Unicoi, NOT the Visitor's Center! I'm just trying to help spread the word! There are going to be two public meetings coming up from the Georgia Department of Natural Resources to inform, answer questions, and get public feedback on the possibility of instituting a year round trout season on Georgia's streams. One meeting is to take place on Thursday, November 13 in Gainesville and the the other will be on Tuesday, November 18 in Acworth. I'll be attending the Gainesville meeting and I hope to see lots of folks there! Currently, trout streams are designated either seasonal or year-round. But, what if that designation were to change? Agency staff recently evaluated the effects of removing the “trout season” entirely and opening all trout waters to year-round fishing. The Georgia Department of Natural Resources’ Wildlife Resources Division would like to have your input on this topic at two upcoming public scoping meetings. Public input is important when considering any changes to fishing regulations, so these scoping meetings will provide an opportunity for interested citizens to hear more about the reasoning and research behind these possible changes from WRD staff, and have a chance to ask questions and provide feedback. Two public scoping meetings are scheduled. People who plan to attend are also encouraged to tell others who may be interested in participating. Both meetings will begin at 7 p.m.